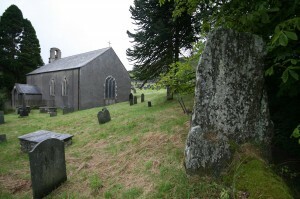 The church of St John the Baptist at Ysbyty Cynfyn is set in a mountain environment between the tourist destination of Devils’ Bridge and the village of Ponterwyd, the birth place of the renowned scholar Sir John Rhys. There are several huge upright stones in the circular graveyard, which hint at an early and even pre-Christian past. The present church was built in the early 19th century but there was at least one other previously on this site. It is believed that the stone for this church came from the demolition of an even older one in a more remote spot. Ysbyty Cynfyn is a sacred and peaceful place. It is believed that a hospitium (Ysbyty) was located here for people travelling to the Cistercian Abbey at Strata Florida, mainly on route from Llanbadarn with whom this church had very strong past links. Food, a bed and medical care were provided if needed. It was believed that the Knights of St John the Hospitallers were responsible for this travellers resting place. It also became the centre of worship for the shepherds of the surrounding hills as well as a resting place. The oldest grave dates from 1793, and repairs carried out at the church is recorded in 1767. 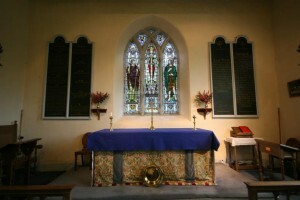 It is known to have been rebuilt or extended in 1827 because there is a panel above the entrance door, on this panel it shows the church had a small gallery at the back which was removed at a later date, it also explains that more seats were added and that some of these were ‘free’. The graveyard is of particular interest, the first recorded quadruplet babies were buried here in 1856. The grave, with its white quartz cross, which is typical for this graveyard, is a reminder of the awful hazards to life from diseases such as typhoid and the tragedies it brought with it. As the church was close to many metal mines, especially Temple mine located in the deep Rheidol gorge behind the church, miners and mine captains graves are also found in this graveyard. It is interesting to see the varied surnames on the gravestones showing the movement of people from other mining areas from as far away as Cornwall. Stone masons were not always accurate at their work, when you visit, how many miss-spelt names and places can you find. During the past year we have compiled and recorded names of those buried in the church graveyard.